Austria has been the birthplace of some of the most incredible creative minds of the last several centuries. Most people will know that Wolfgang Amadeus Mozart hailed from Salzburg, but they might not know about these native sons and daughters. These are just a few world-changing folks who were born there. Guest post from Jamie Matzke who is a representative of the Alpine Club, a Diamond Resorts International club that offers unparalleled vacation value throughout the world. 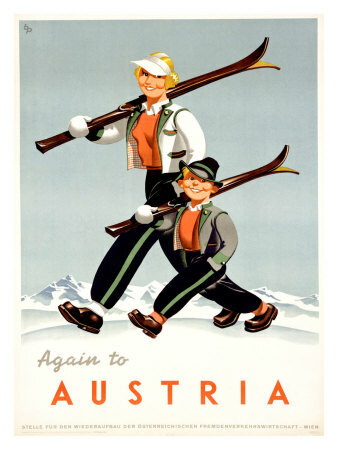 Find out more about the Alpine Club today! There are almost too many scientists born in Austria to count. Christian Doppler, born in 1803 in Salzburg, was a mathematician and physicist who was the first to identify the principles around wave frequencies and relative speed. This effect is now named for him; if you've ever noticed that a fire truck's siren seems to get higher in pitch as it passes by you and then lower as it speeds off, that's the concept he studied. If you can curl your tongue or all of the female members of your family have diamond shaped birthmarks, you can thank Gregor Mendel for figuring out the mechanisms behind genetic inheritance. He did a series of experiments using easily breedable pea plants, and realized that certain characteristics showed up in some generations and not in others. He is credited with the discovery of how dominant and recessive alleles work. Erwin Schrodinger is considered to be one of the keenest minds of the 20th century, one of the fathers of modern physics. He was born in Vienna in 1887 and, after earning several degrees in physics, he became renowned for his work on quantum physics, both through the fundamental equation which bears his name and his now-famous 1935 thought experiment (developed after lots of correspondence with Albert Einstein), involving a cat which is neither alive nor dead until it's observed. Other scientists who hail from the country include mathematician Kurt Godel and physicists Wolfgang Pauli and Ernst Mach. Austria was the home of Sigmund Freud, the father of psychoanalysis, as well as psychiatrists Wilhelm Reich, Leo Kanner, and Hans Asperger. The Vienna Circle was a collection of philosophers and scientific minds who met routinely to pursue a unified science between the two fields. Austria is the home to some truly incredible cinema pioneers. Fritz Lang might not be a household name, but he is undoubtedly one of the most important directors to ever live. His 1927 masterwork 'Metropolis' was the first time a robot had ever been shown in a movie, and is the stylistic influence behind blockbusters like 'Star Wars' and 'Blade Runner'. Upon emigrating to the U.S., Lang became known as the father of film noir with his 1953 production 'The Big Heat'. Your wireless network might not exist today were it not for beautiful actress and inventor Hedy Lamarr, born in Vienna. She first made headlines in 1933 when she starred in the racy film 'Ecstacy'. The mathematically-minded ingenue fled to Hollywood in 1933 and worked alongside Clark Gable and Spencer Tracy. She later co-developed the concept of frequency hopping, which is the basis of spread-spectrum communication tech, and allows Bluetooth and wi-fi to work. Peter Lorre, who starred in Fritz Lang's German film 'M', went to Hollywood and is perhaps best known for his roles in 'Casablanca' and 'The Maltese Falcon'. Billy Wilder, after fleeing World War II, went on to make 'Double Indemnity', 'Sunset Boulevard', 'Sabrina' 'Some Like it Hot' and 'The Lost Weekend'. Arnold Schwarzenegger, Helmut Berger, and recent Academy Award winner Christoph Waltz were all also born in Austria.